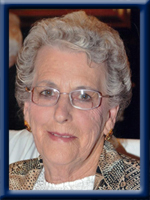 It is with great sadness that we announce the passing of our dear mother, Marie Bezanson, on August 3rd, 2013. Born on November 19, 1932, in Brooklyn, Queens Co., she was the daughter of the late Edna (Kaulback) and F. Theodore Vacheresse. Marie spent most of her life living in and around Nova Scotia and later moved to Mount Forest, Ont. to live with her daughter. Life held many enjoyments for Marie. She was outgoing, enjoyed people, particularly children, travel, many arts and crafts, skating, fishing, cards and music. She taught pre-school for many years and later in life was a caregiver for the elderly. She is survived by her children, Donna Majcan, Airdrie, Alta. ; Sherry Annand, Mount Forest, Ont. ; Cathee (Lenny) Tumbridge, Bermuda; Janice (Kai) Hauswirth, Lower Sackville; Stephen (Andrea), Shubenacadie; Tim (Roisin), Beaver Bank; 15 grandchildren, three great-grandchildren; sister, Joan (William) Penney, Ottawa, Ont. ; and many nieces and nephews. She was predeceased by two sisters, Jacqueline Vacheresse and Donita Card, (Lunenburg); ex-husband, Lorne C Bezanson (Elderbank). Cremation has taken place. Funeral service will be held Saturday, August 10th, 11 AM in First Sackville Presbyterian Church, 60 Beaverbank Rd., Lower Sackville. At the request of Marie, a private family committal will take place at United Baptist Cemetery, Liverpool. In lieu of flowers, donations may be made to the Canadian Cancer Society, the Canadian Celiac Association or to a charity of your choice. Janice and family, we were sorry to read of your Mom’s passing, please accept our sympathy. Just wanted to let you all know that we are thinking about you at this sad time. Our thoughts and prayers are with you all. Take care and God bless. So sorry to hear of your mums passing. She used to come with me to the celiac meetings in Halifax and we became good friends. She spoke of her family often on our drives to the city, she was such a nice lady. I extend my and celiac associations deepest sympathy in your loss. May she rest well. Sincere condolences from the members of the Milford & District Lions Club on the loss of your mother. A contribution in her memory has bee made to the Lions Foundation of Canada. I was so sorry to hear the sad news of your mum’s sudden death. I have you in my prayers and thoughts. May God be you and comfort you during this time. My condolences to the Bezanson family. May she rest in peace in Heaven. My thoughts and prayers are with your and your family during this difficult time. My deepest condolences to you and family on the loss of your mom. My thoughts and prayers are with you. My hearthfelt condolence at this time. I wish comfort for you at this time. We are so sorry to hear about the loss of your Mum. On behalf of your entire Bermuda finance family, we pray that God comforts you and your entire family during this diificult time and May her soul rest in perfect peace.